Wildest Dreams – Damh the Bard Goes Nuts! The Royal Albert Hall, South Kensington, London. In our training course in Druidry, there is an exercise in which you jot down your ‘wildest dreams’. Friend and colleague Damh the Bard recently decided to go for one of his wildest dreams… and I have to confess I feared for his sanity when he told me about it. 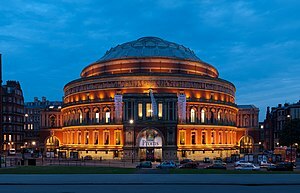 “I want to play a gig in the Albert Hall!’ he said, and as I smiled and muttered something about “It’s rather a big venue isn’t it?” I made a mental note to look up megalomania in my psychology dictionary. “How will he cope with the disappointment, when he realizes this is impossible?” I worried, as I visualized him ‘coming to earth’ with a bang one day. Well blow me down if Damh isn’t well on the way to achieving his wildest dream! This is an amazing example of what can happen when you live your passion, when you are dedicated to your art, and when you combine that with the power of the internet and social networking (and – it must be said – when you’re very good at what you do!). If everyone who has liked Damh’s Facebook page can bring one friend, it’ll be a sell-out! “Imagine the Royal Albert Hall heaving with your friends and people you’ve yet to meet, all gathering to celebrate together and be entertained. Even if I wasn’t playing I’d want to be there. To have come from the early 90′s newspaper slandering to a concert at the Royal Albert Hall would really show just how much our community has grown. So I ask you to tell your friends, talk about this at your moots, in your magazines, on your Facebook groups, in your podcasts. Share the Facebook page and let us see if together we can do this.” Read Damh’s blog post here. Damh is planning to invite other bands and musicians to make it an amazing evening – so do support it if you can! Click ‘Pagan Music Concert’ above to support it! It’s good to see that there is another route to get to perform in in the Royal Albert Hall. I was expecting to see Damh on X-Factor or Britain’s Got Talent with your intro Philip. I don’t know how he would get on with Simon Cowell though. Hmm.. the music business!